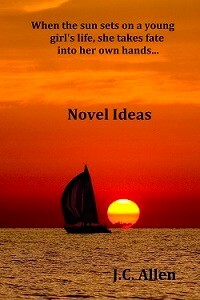 Novel Ideas by J.C. Allen provides a wonderful story to females of any age but, especially young adults and tweens/teens as they seek to put themselves into the position of the book's lead female character. Though written in the third person, I can attest that it was easy to cast myself into the role of Forrest Reed's granddaughter, 12-year-old Penny Reed, imagining that I was living her life instead of merely reading about her. Like Penny, I enjoy swimming - though I can't say I'm as courageous when it comes to trying flips and dives. I can be satisfied with having one close friend. I enjoy spending time on the computer, interacting with others and am quite an industrious individual. I definitely get an incredible high just from spending time outside, even doing something simple such as going for a walk and breathing clean air. In fact, there are quite a few things I seem to have in common with this 12-year-old girl. However, there are some areas in which we, and our lives, are different: both my parents are still alive and I am not an only child. I have always wanted to try sailing - or be a passenger in a sailboat - but never had the opportunity. More importantly, I've never been accused of committing treason, nor any crime. What? A 12-year-old accused of treason? Yes, most definitely, especially when the fictional United States learned she was releasing Forrest Reed's books in cyberspace. You see, Forrest Reed was one of the fictional United States' most hated enemies. His books were banned, fearing he would create an uproar in the country if people were to see the world the way he did. The United States hated him period; however, Forrest would argue saying that he hated the United States and everything the constitution of the year 2040 represented. In fact, he despised the country so much that he decided to leave it behind, a part of his past, never to return. But Forrest didn't move to another continent or even another country as most people would opt to do; he designed an island - a fortress - suspended above, yet anchored to, the Pacific Ocean floor, choosing to live a life of solitude, having minimal contact with people from the outside world - until a granddaughter he hadn't know he had came knocking on his door. It wasn't long before his new life and home were threatened and an evacuation plan was put in order - but would he and his granddaughter escape unscathed or would there be eternal consequences? Novel Ideas really drives home the importance of persevering regardless of what life brings. Regardless of whether we stand or fall in battle, knowing we didn't give up is what's really most important. You can learn more about this book by clicking the book's cover which will take you to the book's page on Amazon. Besure to check the review of M.O.D. and take a look at the author interview.